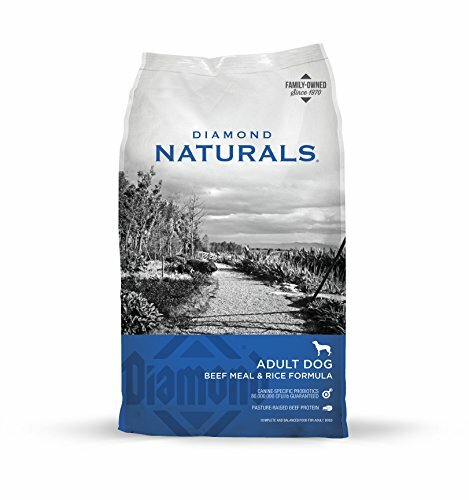 Made with the highest quality ingredients, Diamond Naturals provides complete, holistic nutrition for every pet. Each Diamond Naturals dry formula is enhanced with superfoods and guaranteed probiotics, for optimal nutrition and digestive support. Beef protein, along with added superfoods, provides the energy and muscle building blocks your dog needs to stay active and strong. Guaranteed levels of selenium and vitamin E ensure that your dog is receiving optimum antioxidant nutrition, while omega-6 and omega-3 fatty acids from superfoods help maintain healthy skin and a shiny coat.